A great quote challenge....I love writing Haiku! This is one I did last year while I was doing a creative writing course at my local library. This is a revamped page of the one that that I had displayed at the library. Jody, love the gorgeous sunset photo and clusters and the fabulous Haiku you created. Thank you for joining in this month's quote challenge. Jody, I'm glad that you made your own Haiku. The Haiku poem is different because it does not rhyme. Anne, love the beautiful photos and the beautiful clusters and the fabulous Haiku you created on your gorgeous page. Thank you for joining in this month's quote challenge. Anne, it's wonderful that you love writing Haiku and I remember seeing one of your pages with Haiku that you wrote. I did not know of Haiku. Thanks for enlightening me! Grace, this Challenge will be great Fun. I love Haiku since quiete some time and have used it in earlier Layouts. CanÂ´t wait to finally do another Layout. 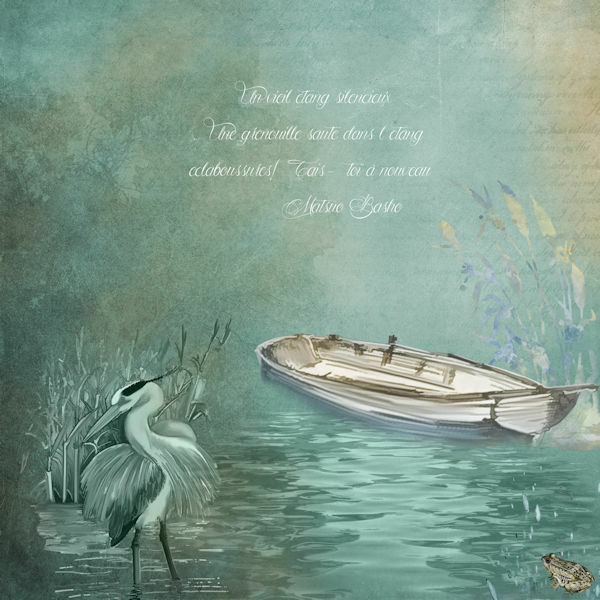 Orkan, love the beautiful blending and the gorgeous scene you created for the wonderful Haiku! Thank you for joining in this month's quote challenge. The wonderful Haiku is beautifully illustrated with the beautiful photo and flowers on your gorgeous page. Thank you for joining in this month's quote challenge. Helga, it's wonderful that you love Haiku! I'm looking forward to seeing your layout. Debbie, beautiful blending and beautiful blowing leaves and wonderful Haiku on your gorgeous page. Thank you for joining in this month's quote challenge. Phyllis, the wonderful Haiku is beautifully illustrated with the beautiful cat and magnolia blossoms on your gorgeous page! Thank you for joining in this month's quote challenge. Love the simplicity of this page...........fits the Haiku perfectly. Beautiful page!